Revolution was in the air in the 1960s. Civil rights protests demanded attention on the airwaves and in the streets. Anger gave way to revolt, and revolt provided the elusive promise of actual change. But a very different civil rights history evolved at the Ionia State Hospital for the Criminally Insane in Ionia, Michigan. Here, far from the national glare of sit-ins, boycotts, or riots, African American men suddenly appeared in the asylum’s previously white, locked wards. Some of these men came to the attention of the state after participating in civil rights demonstrations, while others were sent by the military, the penal system, or the police. Though many of the men hailed from Detroit, ambulances and paddy wagons brought men from other urban centers as well. Once at Ionia, psychiatrists classified these men under a single diagnosis: schizophrenia. 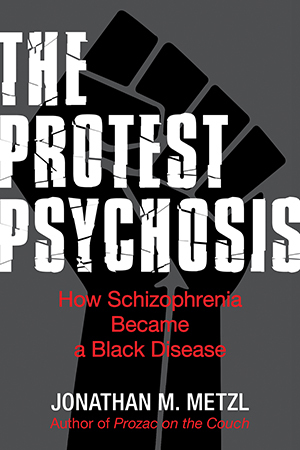 In The Protest Psychosis, psychiatrist and cultural critic Jonathan Metzl tells the shocking story of how schizophrenia became the diagnostic term overwhelmingly applied to African American men at the Ionia State Hospital, and how events at Ionia mirrored national conversations that increasingly linked blackness, madness, and civil rights. Expertly sifting through a vast array of cultural documents from scientific literature, to music lyrics, to riveting, tragic hospital charts Metzl shows how associations between schizophrenia and blackness emerged during the 1960s and 1970s in ways that directly reflected national political events. As he demonstrates, far from resulting from the racist intentions of individual doctors or the symptoms of specific patients, racialized schizophrenia grew from a much wider set of cultural shifts that defined the thoughts, actions, and even the politics of black men as being inherently insane. Ultimately, The Protest Psychosis provides a cautionary tale of how anxieties about race continue to impact doctor-patient interactions, even during our current, seemingly post-race era of genetics, pharmacokinetics, and brain scans. "An enlightening look at how those in power define aberrant behavior and evade self-analysis." Cecil Peterson had no history with the police. Even on the day the white stranger insulted his mother, Peterson simply wanted to eat lunch. He sat in his usual seat at the counter of the diner on Woodward Street and ordered his usual BLT and coffee. Somehow he caught the stranger’s eye in the squinted way that begets immediate conflict between men. The stranger glared. Peterson was not one to walk away from confrontation, but he knew the implications of glaring back. One should not glare back at a white man. So he looked down. But the two men crossed paths again after Peterson paid his tab and walked outside. And then came the remark. And then came the fight. Two white Detroit police officers happened to be passing by the diner that September day in 1966. They ran to the altercation and tried to separate the combatants. At that point, according to their formal report, Peterson turned on the officers and struck them “without provocation.” According to the report, Peterson knocked one officer down and “kicked him in the side.” A second police team arrived and assisted in apprehending the “agitated” Mr. Peterson. Medics took the first officers on the scene to the Wayne County Hospital emergency room. The ER physician’s report noted that both officers had “bruises,” though neither required treatment. The white stranger was not charged. Peterson was twenty-nine, African American, and an unmarried father of four who worked the line at Cadillac Motor Company. He had not previously come to the attention of the state. He had not been diagnosed or treated for any physical or mental illness. Nor had he been held for crimes or misdemeanors. He had limited interactions with white people and preferred to stay close to home. But on that September day in 1966 his life changed along with his identity. He became a prisoner. And then he became a patient. The drive to Ionia took four hours, much of which Mr. Peterson slept off in the back of the police car. But he stiffened when the vehicle pulled into the winding drive that led up to Ionia Hospital; and his attention reached the level of panic when the car doors opened onto the expansive, forty-onebuilding campus of bricks and chimneys and yards and fences and crazy people as far as the eye could see. Dragged inside one of the largest of these buildings, Mr. Peterson shouted and struggled to get away. He said he was an “African warrior” and spoke gibberish, which he claimed to be his native African language. Then, in English, he loudly accused the guards of detaining him against his will. He claimed to be under attack by all white men. Like Peterson, most of the men came from “deteriorated neighborhoods” of Detroit. Most nonetheless held gainful employment. Like Peterson, each was convicted of a crime against person or property, ranging from larceny to murder to various forms of civil unrest. Few of the men had seen psychiatrists prior to their convictions, though this was not surprising since few psychiatrists resided in the urban sections of Detroit in the 1960s and 1970s. The men passed through various courts, prisons, and other state institutions. By the time they arrived at Ionia, they were nothing if not psychotic. Like Peterson, they hallucinated and ideated, or acted withdrawn, suspicious, paranoid, or combative. They argued, and fought, and resisted, and projected. And, according to Cabrioto and his colleagues, these actions were easily explained with a single diagnosis. Click here to see Metzl as a guest on MSNBC'sMelissa Harris-Perry discussing the Trayovn Martin case. Click here to see Metzl as a guest on MSNBC'sMelissa Harris-Perry segment entitled "The Science behind Political Thinking". Click here to see Metzl as a guest on MSNBC'sMelissa Harris-Perry segment entitled "Who Said It: Newt Gingrich or Kanye West? ".